Population: About 3000. Immigration strictly controlled to lessen the environmental impact. Landscape: Volcanic, arid, with cacti and thorn trees. Highest elevation about 1200 feet. 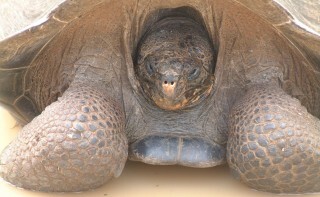 The oldest, and eastern-most of the Galapagos Islands. History: Human history of the Galapagos Islands began with their accidental discovery by the Spanish Bishop of Panama, Thomas De Berlanga, whose ship was swept off course from Central America in 1535. From the 1860's to the 1790's pirates used the islands as refuges, and as a source of meat. (Hundreds of thousands of land tortoises were killed, or hauled on board ships to be kept as meat.) After the pirates came the whalers, who also exploited the animals for food. Most attempts at true colonization failed due to the harsh conditions and lack of fresh water. The first person to actually live on the islands was an Irish rum lover who survived two years on Floreana Island. Once the Ecuadorian government took over jurisdiction of the islands in 1832, other settlers arrived. 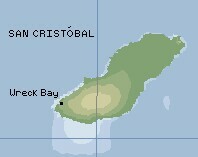 On San Cristóbal, a colony was begun by Manual Cobos whose despotic ruling of the settlers got him assassinated in 1904. Later settlers more successfully created a port and extended the agricultural workings inland from the sea. 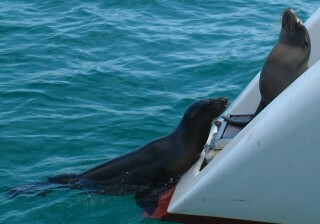 (Amanda age 14) I believe the first thing I saw when we got to San Cristóbal was a sea lion on our sugar-scoop. Well, not the first, but pretty close. Wreck bay is teeming with them. They just love getting up on your boat, into your cockpit, or sleeping in your dinghy. With such easy access to our cockpit, and because we like keeping our companionway open at night, we decided the best thing to do was to put ropes across our sugar-scoops to stop them from going further than the swim platform. Thanks, but I don't need a sea lion waking me up in the morning. I think I only went ashore there once or twice, which, now that I look back on it, is sort of sad. First time was for our tour around the island with our friends on Vamp. This consisted of - why was it even a surprise? 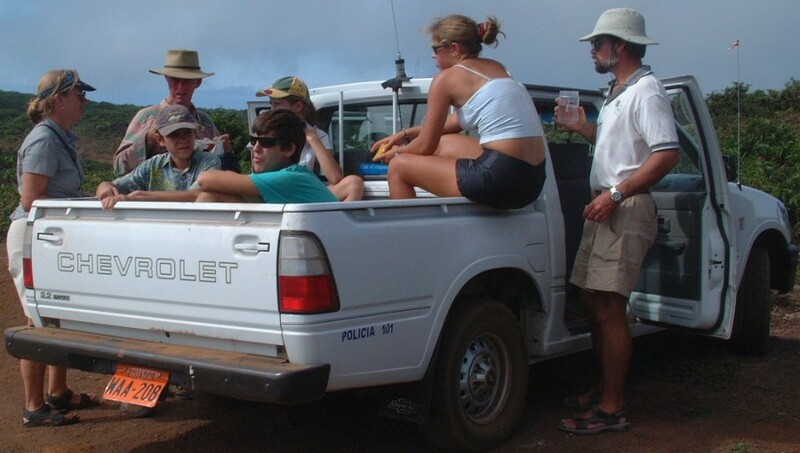 - being driven around in the back of a pickup. We went up to a hill, and took a half-hour walk up to the top and around the crater. It was interesting, seeing the transition of vegetations zones. 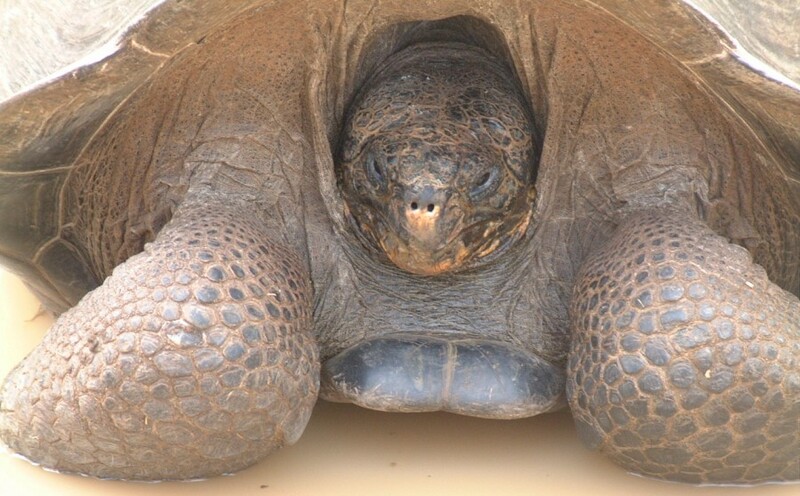 San Cristóbal was also the first place we saw the galapago, the giant tortoise for which the islands were named. There aren't many on the islands any more, so there are several reserves for them on the various islands. We went to one such reserve, and let me tell you they were amazing! Infinitely gentle, they munch away indifferently as you admire them. We saw one taking a bath, and another, a baby, that our guide picked up and put in the middle of the trail so we could take a close look at it. From the moment we came near, it's head was tucked away, forelegs bending in to protect it, but after a while it poked out again. It had obviously been eating, as it still had greenery clinging to its mouth. I thought it was cute, but other people said it was a face only its mother could love. We also stopped to collect some wild guavas, introduced to the Galapagos and therefore a pest. We were only too glad to relieve them of the fruit. 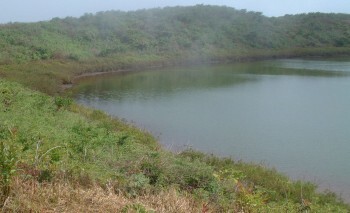 We also went ashore to see the Interpretive Center, and to take a walk through a cactus forest to another cove. After the San Blas, the last place I had gone swimming in the ocean, this place was like ice! But Rachel and I just had to prove ourselves - if to no one else but ourselves - so we dove in to swim with the sea lions. It took us about ten minutes to realize we'd had enough, but we still ragged at Chris, who had stayed high and dry on the rocks. (Chris age 16) I liked San Cristóbal for several reasons. For one thing, I have never yet failed to be happy about the end of a passage, although the passage here was not bad. We got a nice view of Kicker Rock as we came in, motoring around and looking at all the birds, before going into Wreck Bay (great name!) 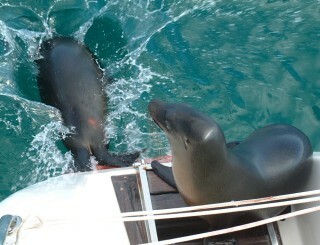 and seeing sea lions EVERYWHERE! 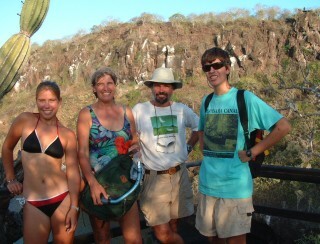 For another, just being in the Galapagos with all the animals was wonderful. For example, seeing the tortoises was great. We didn't get to see any really in the wild, but it was fun anyhow. Watching the sea lions play was really fun interesting too. I think the part of San Cristóbal I got the most out of, however, was the local interpretive center. Lots of really interesting information about the islands' natural and social histories, plus a lot of the things that make the islands unique. I was also quite impressed by their area devoted to conservation, which was very informative about a subject that is extremely important in the Galapagos. (Jon) The morning we arrived in San Cristóbal, I had a crown work loose in my mouth, causing me severe pain. We searched the small village and found 3 'dentists', but only 1 with any real equipment (like X-ray or autoclave). Sanitary conditions were only marginal (he used an autoclave and gloves, but he also answered the phone wearing the same gloves he stuck in my mouth). But at least he relieved me of the pain, removed the crown, and drilled out 2 or 3 roots. The problem was that he could not do any restoration work. So even though we could have stayed longer on San Cristóbal, we left after a few days and headed for Santa Cruz island, which has a much larger population (and, we hoped, better dentistry). Searching for dentists had the beneficial side effect that we found a nice cheap taxi driver who was willing to take us and Vamp on a tour of the island for a flat fee of US$30. Taxi is perhaps a bit grandiose, as all he had was the ubiquitous twin-cab pickup. So we threw the 4 kids in the bed and the adults in the cab and we had a fun tour. One of the strange thing about all officialdom in the Galapagos was that the Harbor-masters all said that we could not visit any other islands, but that we had to stay in 'their' island. But the tourist department said that wasn't true, and that we could visit any of the 4 populated anchorages, as long as we checked in at each new island. Like good cruisers, we believed the person that said what we wanted to hear. The Harbor-master in San Cristóbal was also reputed to be somewhat corrupt, searching boats and sometimes confiscating alcohol. When we went to check in, which usually involves filling out a series of forms in their office and sometimes paying a nominal fee, he just waved us out, saying that someone would come to the boat later that afternoon. But as we walked away we realized that he hadn't even asked us the name of our boat. We made sure we were on board at the appointed hour for the next few days but nobody ever came. (Sue) Arriving in the Galapagos without a guide book was disconcerting, but I found one on our first afternoon at a little book/souvenir shop in the town of Puerto Barquerizo Moreno (the capital of the Galapagos). It was really helpful for our inland tour by pickup through the miconia and scalasia zones of vegetation, and for identifying the birds and reptiles. Wreck Bay is a sleepy little harbor, and I could have spent more time there, but we had to get Jon's tooth taken care of, so we pushed off in two days for the bigger town of Puerto Ayora on Santa Cruz. San Cristóbal was a good introduction to the giant tortoises, the history of the islands at the Interpretive Center, and a nice hike over lava rock and around cacti on the headlands.